Ultrasonic welding is one of the most widely used processes for bonding polymers, valued for its speed, flexibility, and low cost. Recently, there has been a call for more controlled and consistent ultrasonic welding processes, as part designs become more complex and requirements more stringent. There is also a need for strong, dimensionally consistent parts that show good cosmetics. The process used to meet these increasing demands must be consistent and repeatable over time. Dukane has worked to meet this demand through the development of a new iQ series Servo-Driven Ultrasonic Welder with Melt-Match® technology. In the ultrasonic welding process, there are three fundamental process variables that have a direct effect on weld quality: amplitude, force, and duration. The first of these parameters, amplitude, has long been controlled through frequency selection, horn-booster design and modulation of the electrical input to the transducer. The second of these parameters, duration, could be controlled only by setting a specific weld time, for 50 years. In 1988 this was revolutionized by Dukane’s development of welding by distance, thus allowing greatly improved troubleshooting and process control. Recently, a new precise method of force control has been introduced with Dukane’s servo-driven ultrasonic welder in 2009. This new development allows complete control of the third parameter that defines ultrasonic welding, force. In recent years, there has been a plethora of research conducted with the new servo-driven ultrasonic welder. Each of these experimental studies has demonstrated the unique benefits of using servo-driven ultrasonic welders. We are entering an exciting new age of ultrasonic welding. Dukane’s servo-driven ultrasonic welder offers greater process control than was ever possible before which will allow welding of even more complex and demanding applications. It has long been known that better process control leads to improved part quality and consistency. As Robert Leaversuch noted in 2002, “in automotive, medical, and other demanding sectors, use of advanced controls is critical to meeting strict quality requirements” [G]. In this, as so much else, servo welders are at the “top of the process-capability food chain” [F]. Because all of the process settings are controlled electronically, it is easy to switch between welders [I]. Also, this greatly simplifies the calibration and validation processes. Dukane’s servo-driven ultrasonic welder further eases process optimization by allowing all the weld data to be exported in formats that can easily be imported to excel or Minitab for analysis [E]. The data produced by the generator in the form of graphs or weld data is very useful for process optimization and troubleshooting [H]. Simply said, servo welders “take control of the process away from the plastic” [F]. 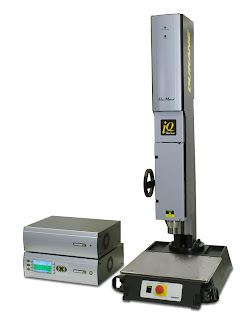 The servo welder has been shown to consistently produce more repeatable results through multiple methods of evaluation. A study done at Value Plastics, a manufacturer of precision molded couplers and components for various industries including medical, showed that the servo welder produced much more consistently hermetic welds (as measured using pressure decay) with a standard deviation of 0.4% compared to 2.9% when using a pneumatic welder [A]. The servo-driven ultrasonic welder also offers “excellent repeatability of collapse distance from part to part” [B]. In a pneumatic system there is a limit to the speed at which air can escape the cylinder, preventing abrupt changes in velocity and reducing distance control. Dukane’s servo ultrasonic welder can accelerate up to a rate of 1270 mm/s², allowing almost instantaneous velocity shifts during the weld and hold phases [I]. An initial study of the servo ultrasonic welder in 2009 showed that the servo welder was able to achieve a standard deviation of 1.1% in measured collapse distance compared to 3.9% achieved with the pneumatic welder [C]. Value Plastics was able to achieve a standard deviation of collapse of 0.9% in production using Dukane’s servo-driven ultrasonic welder [I]. Other studies have shown that using servo ultrasonic technology produces parts with more repeatable weld strength. Experimentation at The Ohio State University has shown a standard deviation of weld strength of 5.1% when using Dukane’s servo-driven ultrasonic welder, compared to 9.4% when using a pneumatic welder [D]. At Turku University of Applied Sciences in Finland, experiments demonstrated that standard deviation in weld strength can be halved when switching from a pneumatic welder to a servo-driven welder on parts with shear joints [E]. Clearly, servo-driven ultrasonic technology offers improved repeatability, measurement accuracy and more precision. This improved consistency will be needed as products become increasingly complex. In addition to increased repeatability, multiple studies have shown that servo-driven ultrasonic welders produce parts with increased weld strength over parts produced with pneumatic welders [1, 2, 6, 8]. Even under non-ideal circumstances (such as when grease is present in the joint or the energy director is damaged), servo welders were able to create stronger bonds than pneumatic welders [F]. Servo technology has proved to provide greater tolerance of part variations, allowing greater weld strength – as demonstrated by fractures occurring in the bulk material rather than in the joint as was seen when using pneumatics [A]. Experimentation at a Finnish University showed that parts welded with Dukane’s servo-driven ultrasonic welder were 19.1% stronger when using a shear joint and 21.4% stronger when using an energy director than parts welded using a pneumatic welder [E]. In the first study performed by Dukane on the new servo welder, weld strength was 16.7% greater than pneumatically welded samples [C]. Even with just 59% of the energy input, parts welded with Dukane’s servo-driven ultrasonic welder were consistently more leak tight than parts welded with a pneumatic welder [A]. A. M. Marcus, K. Holt, A. Mendes. “Benefit of Servo-Ultrasonic Welder to Medical Industry – A Case History” ANTEC 2012. C. M. Marcus, P. Golko, S. Lester, L. Klinstein. “Comparison of Servo-Driven Ultrasonic Welder to Standard Pneumatic Ultrasonic Welder” ANTEC 2009. D. A. Mokhtarzadeh and A. Benatar. “Comparison of Servo and Pneumatic Ultrasonic Welding of HDPE Shear Joints” ANTEC 2011. E. H. Turunen. “Ultrasonic Welding for Plastics” Bachelor’s Thesis, Turku University of Applied Sciences, Finland. 2011. F. T. Kirkland. “Ultrasonic Welding: The Need for Speed Control” Plastics Decorating. July/August, 2012. G. R. Leaversuch. “How to Use those Fancy Ultrasonic Welding Controls” Plastics Technology. Oct 2002.